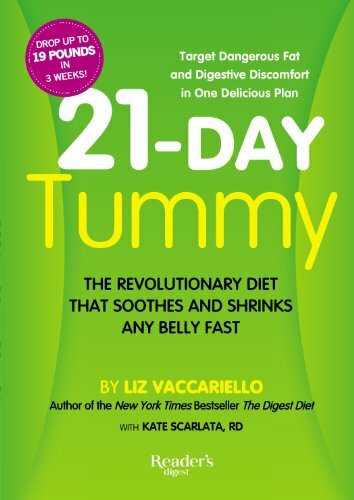 21-Day Tummy. The Revolutionary Diet that Shrinks and Soothes Any Belly Fast. Liz Vaccariello with Kate Scarlata. quite an apt post christmas book!! Like so many people I’m always conscious of my weight and especially my tummy 😦 Now I’m a wheelchair user that’s even more noticeable, so this book had me hooked just from the title! I’m reading it on kindle though – I love my kindle but have learned that some books such as this one are simply better in traditional format, where its easier to flick through and browse for what interests you. Its packed with useful information on many common ailments – those where we’re not always ill, but where the effects of diet make us feel below par. Of course there’s practical tips too for those who have problems such as arthritis, diabetes, irritable bowel, indigestion, all the illnesses that can be helped by a proper diet. Our portions have increased vastly over the years from what we actually need to eat, and add to that the way we eat so much processed food its no wonder our stomach and health is so often suffering. I found it really interesting reading. I like to think I’m quite aware of food and the healthy eating we need and yet…there were issues that hadn’t occurred to m,e and were good to know. The recipes were practical and easy to follow even for a Brit reader – I love the US way of weighing using cups – though a stick of butter…. ? that needs looking up, likewise some foods: arugula, scallions, cilantro – google is my friend for telling what the UK name is 🙂 Added to that there are some simple, easy to follow exercises that can be fitted into everyday life. Again some like the walking/standing ones are out for me, but the sitting/lying ones I’ll certainly try. After Xmas of course!! Jan always signals my resolve to get more healthy and maybe this year with the help of this book I’ll actually do it! All in all this is a really useful book for people looking to make the best of their bodies, to help them run at maximum efficiency and to make us not only look slimmer but to be slimmer. Stars: five. Excellent all round book, though buy the traditional format rather than ebook for easiest research .